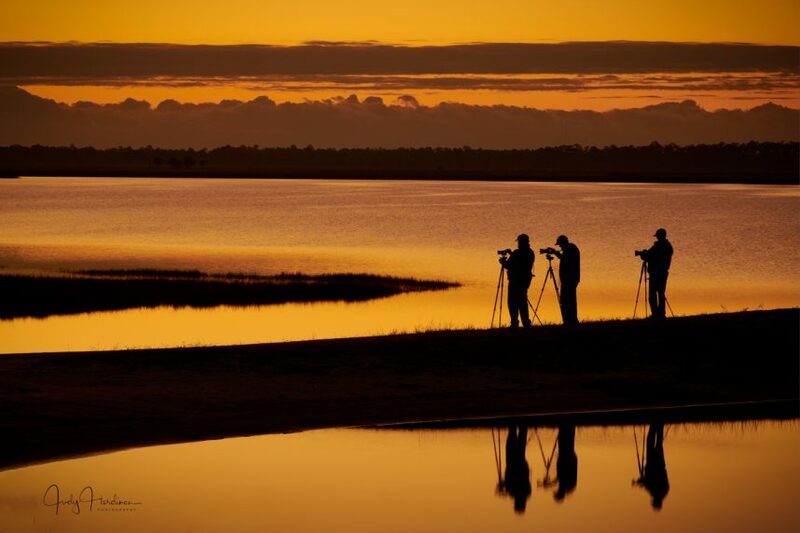 Last week, Jim and I joined a few of our photography friends for some sunrise photography at Loughman Lake in Mims, Florida. It is quite a spectacular location early in the morning. Nature is just starting to wake up, it is calm, quiet and very peaceful. You quickly forget about your long to-do list, what may be going on in the news and it helps put everything in proper perspective. It is a wonderful way to start your day. For photographers, you will find several different subjects to include in your foreground and when you capture them as a silhouette, your images will really stand out. At this location, you will find palm trees, narrow strips of land and various birds. When I took this image, I was thinking about the three photographers who were busy focusing on their subjects. I thought this would make an interesting story. I was able to capture the beautiful light, the various layers and tell a story at the same time. When I do go out with other photographers, I make it a point to go right when they go left. I prefer to go in the opposite direction from the group as this forces me to look at the scene in a different way. It is a great way to practice ‘thinking outside the box’. Later, when everyone has moved on, I may try to shoot a few images from their location. It is not easy to get up early in the morning, especially if you have a long drive ahead of you; however, the light can be quite beautiful and you never know, that may be the morning that you get that once in a lifetime shot. Hi Judy and Jim…sorry to hear you are leaving the newsletter aspect of you busy lives and travel. I completely understand, but will miss the articles. I get to travel along with you two via your well written articles and stunning images! I always lean something and have saved some tips along the day. A monthy newsletter is quite a committment, and you have done well to contribitude. Hope you are enjoying the “warment temperatures” of Florida. Our weather has been a cycle of extremen cold, followed by a fast warm-up which causes very high winds, ice pellets, freezing rain…and usually for our neck of the woods things turn to rain eventually! Interesting to say the least. Lots of salt and sanding going on! These conditions are leading to potholes that will swallow your car! Travel safe! Sheila, Thank you for reading our newsletters. We always appreciate your support and encouragement. As promised, I did post something today on my Facebook account that I would have posted in a newsletter. Check out my page and watch the video of a single cell developing into a Newt. It really is fascinating.